SHOULD PARENTS LOSE CUSTODY OF OBESE CHILDREN? An increasing number of countries are grappling with whether morbidly obese children should be taken from their parents amid the Western world’s obesity epidemic? Removing children from their parents remains a last resort, but obesity experts are increasingly debating whether doing so can boost a child’s chances for a healthier life. 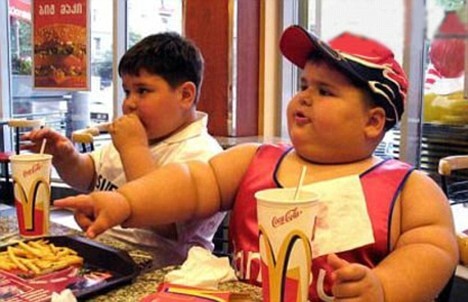 Childhood obesity can lead to a plethora of health problems, including Type 2 diabetes. Amongst other ailments, overweight children can also develop insulin resistance, hypertension, high cholesterol, sleep apnea and orthopedic problems and go into early puberty. The latest case to make headlines concerns South Carolina mother, Jerri Gray, who lost custody of her 14-year-old, 555-lb. son in May. Obesity appears to be the primary reason the boy was taken away by the state. The mother was arrested after missing a court date to determine whether she should retain custody after doctors had expressed concern about her son’s weight to social services. The boy is currently living with his aunt, and his mother is facing criminal child-neglect charges. Several other cases in recent years — in California, New Mexico, Texas and New York, as well as Canada — have garnered attention because a child’s obesity resulted in loss of custody. “It’s happening more than the public is aware of, but because these cases are usually kept quiet [as a result of child-privacy laws], we have no record,” says Dr. Matt Capehorn, who sits on the board of the U.K.’s National Obesity Forum. Yet the parents’ share of responsibility in weight gain isn’t always easy to judge. “It’s unfair to blame solely the parents, when there’s a myriad of other factors influencing a child’s weight,” says Dr. Dana Rofey of the University of Pittsburgh. She says contributing factors include not just genetic predisposition and socioeconomic status but also environmental factors, like whether children have access to parks and playgrounds. Some parents are stuck between a rock and a hard place because there are many busy parents with limited means and no health insurance, and lose control of monitoring their children’s eating 24/7. It is an extreme measure for the state to take the children away from their parents and to charge the parents criminally. The state must prove by clear and convincing evidence that the child is obese due to the parent’s lack of oversight and that they are directly responsible. The judge should adhere to the best interest of the child standard and take into account whether it is in the best interest of the child to lose weight, or to remain in the home with the parents. It is debatable whether it is healthier for the child to lose weight at the expense of not being in their home, or it is healthier to be with the parents. A potential floodgate of these cases may arise. For example, what’s to prevent the state from taking 16 year old girls away from their parents for being too skinny – an equally important medical consideration. Parents have a responsibility to monitor their children’s behaviour because as a society, we don’t want the State to raise our children and have our world mirror Adolux Huxley’s Brave New World.